Governors and ex-governors are powerful forces in Nigerian elections. To a large extent, they determine the candidates who lose and win elections in their respective states, be it in presidential, governorship, National Assembly or state assembly polls. contest senatorial elections after their sojourn in government houses often coast to victory. However, the February 23, 2019 National Assembly election was a major exception! The election recorded perhaps the highest number of ex-governors and governors who lost their bid to either go or return to the Senate. At least, eight incumbent governors and ex-governors lost in the last Saturday senatorial election. This comprises six ex-governors and two serving governors. The two incumbent governors who lost in the senatorial election are Abiola Ajumobi of Oyo State and Ibrahim Dankwambo of Gombe State. The six ex-governors who also lost their Senate bids are Senate President Bukola Saraki ( former governor of Kwara State); ex-Senate Minority Leader Godswill Akpabio (former governor of Akwa Ibom State); and Emmanuel Uduaghan of Delta State. Others are George Akume of Benue State; Olusegun Mimiko of Ondo State and Andy Uba of Anambra State. Political analysts described the losses as colossal and unprecedented, likening them to the fall of “mighty men” in the political circle. But observers have adduced some reasons for the fall of the notable politicians. Akpabio was defeated in his quest for re-election into the Senate. Akpabio, who was the governor of the oil-rich Akwa-Ibom State from 2007 to 2015, was humbled by Chris Ekpenyong of the Peoples Democratic Party. The former Senate minority leader has been in war of control of the state with his political godson and successor, Udom Emmanuel. Prior to the election, Akpabio had boasted he would deliver the state to President Muhammadu Buhari within three hours. Those were the words of Akpabio in a media interview on January 20, 2019, about a month before the conduct of the February 23 presidential and National Assembly elections. The former governor, until his defeat in the last Saturday race for the Akwa Ibom North West Senatorial District, was seen as the ‘father’ of Akwa Ibom State politics. He had often referred to himself as the ‘uncommon defector’ following his defection to the APC from the PDP. The ‘uncommon’ defector was defeated by Ekpenyong, who has been described as an ‘uncommon’ contender. Ekpenyong is an uncommon contender because apart from being a former deputy to ex-governor Victor Attah, his name does not resonate in the Akwa Ibom State politics like that of Akpabio, who was a political colossus in the state. According to the result declared by the INEC Returning Officer, Prof Peter Ogbang, the PDP candidate scored a total of 118,215 votes to defeat Akpabio, who secured 83,158 of the total votes cast in the election. Unfortunately, unlike his claims that the elections would be concluded in the state in three hours, Akpabio, had after casting his vote on February 23 at the Polling Unit 9 in Ukana West, Ward 2 located in the premises of the Independent High School, Ukana, Essien Udim Local Government Area, remained within the school premises for over eight hours until the result of the unit was counted, recorded and announced in his favour. Again, for several days, the result could not be announced by INEC due to serious security threat in the senatorial district, ostensibly by Akpabio’s supporters. However, when it became obvious that the security threat might not abate and time was running against the commission, the INEC Returning Officer for the senatorial district, Ogbang, had to declare the result in Uyo. But Akpabio had immediately petitioned the REC over the results of the election in the Akwa Ibom North-West District. In the petition signed by his brother, Ibanga Akpabio, who was the APC senatorial agent, the senator accused the REC of giving the go ahead to the collation officer to announce the result from Obot-Akara LGA which had been allegedly cancelled. Akpabio had also alleged that it was unfair to his party (APC) for the REC to single out the votes from Essien Udim LGA for a recount. The senator is from Essien Udim LGA, while Ekpenyong is from Obot-Akara LGA. But analysts said the result of the election had signaled the end of Akpabio’s race to the Red Chamber. The result came as a bombshell to his supporters and political associates. For many who knew Akpabio, the shock generated by that defeat will remain indelible for a long time to come given the reputation he has built for himself over the years. 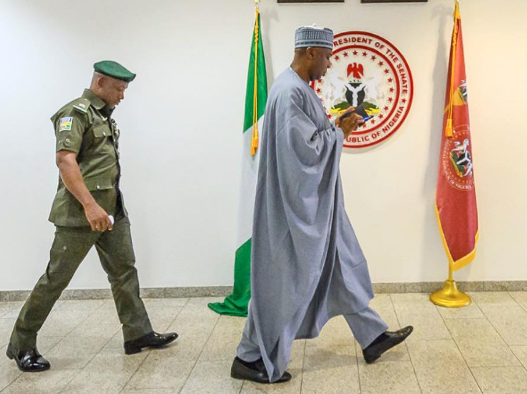 The Senate President Bukola Saraki who was also the director-general of the Atiku Campaign Organisation, suffered defeat in his bid for a third term in the Senate last Saturday. The godfather of Kwara State politics served as governor of the state from 2003-2011 before moving to the Senate in 2011. According to INEC, Saraki of the PDP polled 68,994 votes and was defeated by Ibrahim Oloriegbe of the APC who polled 123, 808 votes from the four local governments of the Kwara Central Senatorial District. Political analysts said the defeat had ended the Sarakis’ political dynasty in Kwara State. Media reports indicated that the people of the state were tired of Saraki’s leadership which has not brought any meaningful development to the state. Hence, bad governance was said to be a major cause of his fall. The Senate President has also been accused of being dictatorial. In 2011, Saraki allegedly made Alhaji Abdulfattah Ahmed the governor of the state, but the governor has not performed well in the administration of the state. He is allegedly owing months of salary arrears to teachers and local government council staff. Another strong factor responsible for Saraki’s defeat was the crisis in the APC, the platform through which he won election into the Senate. He had emerged as the Senate President against the APC leadership’s directive. He was later charged before the Code of Conduct Tribunal for an alleged non declaration of assets. He also faced some internal crisis within the APC. These did not allow him to visit his constituency regularly. Analysts believe these factors prepared the ground for his defeat. Again, the campaign against the Senate President did not begin during the electioneering of the 2019 general elections. According to analysts, it started about three and half years ago when his political allies who fell out with him started to mount campaigns against his administration especially through private radio programmes. The electorate were educated about the dismal performance of the state government and it was from the radio talks that the slogan “O to ge” meaning “enough is enough” became the talk of the town. The APC in Kwara State later chose this slogan as its campaign theme. Analysing the situation, an Islamic scholar and lecturer at the Department of Arabic and Islamic Studies, University of Ilorin, Dr Abubakar Aliagan, said, “The message, ‘O to ge’, won the election for the APC in Kwara State. People were already fed up with the style of administration of the Senate President, Dr. Bukola Saraki. As the political godfather of the state, people were tired of him and they just wanted a change. The defeat of Dr Saraki is from God. Abiola Ajimobi, the outgoing governor of Oyo State, lost the Oyo South Senatorial District election to the candidate of the PDP, Kola Balogun, last weekend. Balogun garnered 105, 716 votes to defeat the APC candidate, Ajimobi, who got 92, 218. In 2003, Ajimobi who had just retired from the oil sector won the support of critical stakeholders including late Lam Adesina and won his bid for the Oyo South Senatorial District. In 2011, top politicians, businessmen and traditional rulers became disenchanted with Adebayo Alao-Akala’s administration and supported Ajimobi under the platform of the Action Congress of Nigeria to become the governor. He won the election, beating the incumbent governor, the first time in the history of the Pacesetter state. Again, in 2015, Ajimobi became the ‘Koseleri’ (unprecedented) as he won the elusive second term ticket hitherto deprived all his predecessors from the days of Chief Bola Ige in the Second Republic. At every forum, till last weekend when he lost the senatorial ticket, Ajimobi flaunted his koseleri title. The governor appeared looming too large to the extent that he elevated and enthroned 21 kings in a day in 2017, against the tradition of Ibadan and without recourse to the Olubadan, Oba Saliu Adetunji, who had since then fallen out with the power-that-be in the state. The governor’s indifference to state workers’ plight especially those in the institutions of higher learning being owed between three and 18 months salary arrears were among the factors that led to his downfall, according to political observers. Another major factor was the intra party crisis that rocked the APC in the state, which made a group within the party to leave en masse for another party. A social critic and chieftain of the APC in the Ibadan North Local Government Area, Alhaji Ismaila Ashipa, described the governor’s human management skill as zero. In his comments, a journalist and political observer, Mr. Ademola Adejuyigbe, said, “Ajimobi had vowed not to seek election again in 2016. His decision to bid for the Senate came late, having failed to take certain factors into consideration. For instance if he had anticipated Ibadan protest votes over Obaship, he ought to have reached out to the Ibarapa people long before now in appointments and projects. “I am aware of three protest letters from Ibarapa over his lopsided appointments and dearth of meaningful projects in the area except for the Ibarapa Poly. A broadcaster (name withheld), said, “The anti-Buhari sentiment in Oyo State and Atiku’s surge in addition to the public disdain for his perceived arrogance, serial caustic outbursts and penchant for playing God, especially partial demolition of Fresh FM station, Ibadan, in flagrant disobedience to court’s order, contributed to his failure”. Another contributor, Adedokun Aderibigbe, also said arrogance and Atiku Abubakar factor as well as over confidence on the part of the governor led to his downfall. But the APC spokesman in the state, Dr. Abdulazeez Olatunde, disagreed with the respondents’ claims, insisting that the governor lost because of massive rigging by the PDP. If endorsements by groups were the only requirement to win an elective position, former Delta State Governor, Dr. Emmanuel Uduaghan, would have won last Saturday’s senatorial contest for the Delta South Senatorial District slot. Before the election, no fewer than 50 groups including the Ijaw Liberation Movement, Isoko Political Revolutionary Force and Itsekiri Youths Vanguard, had endorsed his candidature. The various groups described Uduaghan, the candidate of the APC, as the man better positioned to provide effective representation for the people of the district where the incumbent, Senator James Manager, has held sway for 16 years. Uduaghan, the former governor of Delta State, had tried to win Manager in the past. The ex-governor, who recently defected to the APC again contested against Manager for the Delta South Senatorial District slot but lost. He polled 125,776 votes against Manager who polled 258,812. Uduaghan is of the Itsekiri ethnic stock in the Delta South while his main rival, Manager, is of the Ijaw stock. The district comprises eight local government areas of which the Itsekiris are in the minority. Political observers linked his failure to clinch the senatorial seat on his alleged poor performance as governor, defection from the PDP and tribal sentiments. Uduaghan’s kinsman, Chief Omolubi Newuwumi, said the major factor that led to the defeat of the ex-governor at the poll was his alleged failure to provide infrastructural and human developments to the district during his tenure as governor. Newuwumi, who served as a commissioner for Youths Development under Uduaghan, claimed that his former boss’ performance was so woeful that they (his kinsmen) did not see anything on the ground to campaign for him. He dismissed the speculation in some quarters that the ex-governor failed because the Itsekiri people were in the minority in the senatorial district. The ex-aide also said Uduaghan’s defection from the PDP was another reason he fell like a pack of cards. He said the ex-governor knew that he could not get the senatorial ticket in the PDP, even as the Itsekiri were not ready to vote for him in the PDP. He claimed that the development made him to jump the ship from the PDP to the APC. Speaking in a similar vein, a public affairs commentator, Mr Sheriff Mulade, said the reason Uduaghan could not make it to the Senate was as a result of leadership failure while he was in government. “It was the failure of his presence in terms of infrastructure, empowerment and social duty,” he said. Mimiko’s aspiration to represent the Ondo Central Senatorial District suffered a defeat last Saturday. Mimiko served as governor of the Sunshine state from 2009-2017 but came a distant third in the three-horse race. Both Mimiko and the incumbent senator, Tayo Alasoadura of the APC could not stand the tsunami of former Senator Ayo Akinyelure of the PDP. Akinyelure scored 66,978 votes to beat the APC candidate to the second place with 57,828 votes. The former governor, who contested under the platform of Zenith Labour Party, polled 56,628 votes. Out of the six local governments in the senatorial district-the Akure South, Akure North, Ifedore, Idanre, Ondo East and Ondo West-the former governor won convincingly in Ondo West and slightly in Ondo East but lost heavily in the other four local governments. It was gathered that the major reason Mimiko lost the election was the new party (ZLP) under which he contested. It was believed that if the former governor had contested under the PDP, he would have won the election landslide because all his ‘foot soldiers’ and his former aides who could work for him were still in the PDP. Secondly, he was said to have offended some Akure indigenes in the Akure South LGA (which has the highest number of voters in the state) when he was the governor and those people campaigned and worked against him. George Akume, a former governor of Benue State, has been in the Senate since 2007 but his fourth term re-election bid ended in defeat. Akume who is the leader of the ruling APC in the state following the defection of the state governor, Samuel Ortom and Senator Barnabas Gemade from the APC was defeated by a member of the House of Representatives, Oker Jev. Jev got 157,726 votes while Akume garnered 115, 422 votes, according to INEC. Akume’ defeat in the last Saturday NASS lection did not come to the people of Benue State particularly the Tiv people as a surprise. It was a concluded project initiated by his estranged political godson, Ortom; perfected by the ‘Tiv traditional rulers and executed by the Tiv electorate especially the people of the Benue North West Senatorial District. Akume caught his teeth in politics when he served as a personal assistant to Dr Iyorchia Ayu in 1992 when he (Ayu) was the senate president. Akume steadily rose to become the governor of the state in 1999 through the help of Gemade who was then regarded as the political lion of Benue State. Since Akume left office in 2007, he had enjoyed the support of the Tiv nation due to his generosity. But today, Akume does not have the same support and the reason is not farfetched. Herdsmen had in 2018 attacked some local government areas of the state and killed no fewer than 500 people. Akume’s position on the killings pitched him against the Tiv people. Akume later led some elders to the President on a courtesy visit where he exonerated herdsmen from the attack on Mbalom Catholic Church where two priests and 17 parishioners were killed. Akume was quoted to have said that it was the people of Benue that killed themselves at Mbalom. This statement filtered into the state like a wild fire and the Tiv people saw the former governor as an enemy of the state. A political observer in the state, Ternever Kajo, said that to end Akume perceived terror reign, some traditional rulers were said to have met two days before the election where it was allegedly resolved that the people in his senatorial district must not vote for him. Although Andy Uba served for 14 days in 2007 as the governor of Anambra State, he is still regarded as a former governor. He has been in the Senate since 2011. However, his re-election bid on Saturday under the platform of the APC failed. He was defeated by the Chairman of Capital Oil and Gas, Ifeanyi Ubah. More humiliating for the ranking senator is that he came a distant fourth. Ubah who is the candidate of the Young Progressives Party polled a total of 87, 081 votes to emerge winner of the Anambra South Senatorial District election, while the younger brother of the incumbent Senator, Chris Uba polled 62,462 votes. Nicholas Ukachukwu, who is the candidate of the All Progressives Grand Alliance, scored 51,269 votes while Sen. Andy Uba, the incumbent and the APC candidate, got 13,245 votes. Andy failed because his political platform (APC) is not quite acceptable in the area, according to political analysts. It is understood that most people in the South-East see it as Buhari’s party which to them has not reasonably patronised the Igbo. Also, the quarrel between Andy and his younger brother, Chris Uba, who contested the same senatorial seat, diminished his chances in the contest. Besides, the Uba family had held to the senatorial seat of the district since 1999. The eldest Uba, Ugochukwu, had first occupied the seat, followed by the incumbent who has held the sway for eight years. To the electorate, the family had held the position for too long. Again, most people were of the opinion that for the eight years he was at the senate, he did not attract development to the district. This election cycle is a bad one for Governor Ibrahim Dankwambo who suffered defeat at the PDP presidential primary election where he came fifth. Last Saturday, Dankwambo only polled 88,016 against Saidu Ahmed Alkali who polled 152,551 votes. Dankwambo who is Atiku Abubakar’s campaign coordinator for the North-East could not deliver the state for Atiku as the PDP candidate also suffered defeat in the region.